Choice Of Unfiltered Arcylic Bit, Filtered Danish Bit, or Filtered Bit options. It features a classic dark stained cob bowl with a genuine hardwood bottom to prevent premature burn-through! It also boasts an American Birch hardwood stem and is now available with your choice of either a bent unfiltered premium acrylic bit (mouthpiece) or the popular plastic bent “Danish” bit, which for the first time allows the Freehand to accept the popular Medico filters. 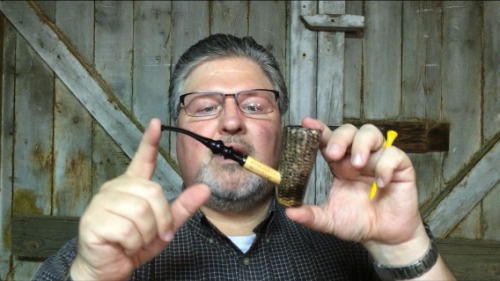 Here's a video that I shot in 2011 after Missouri Meerschaum made the change to the Freehand pipe. In this video I discuss aftermarket bits and the advantages of our old vulcanized rubber bit. This has been replaced by an acrylic version of the same shape and size. The Freehand has come to be my favorite cob! The Legend is for knock around / toss around use. The Freehand is for sitting back and enjoying your pipe dream contemplation. It's an exceptional smoker and Aristocob is the place to purchase it. just received couple of days ago and have not put it dawn. I have never rated a pipe of any kind before but I just had to say that I really am enjoying my new pipe from MM via Aristocob. I am especially enjoying my new Freehand. Although my pipe collection is modest with only 15 my enjoyment of the cob is growing into an everyday experience. It is by far the coolest, sweetest smoke for the money spent. I have sung its praises so much to a fellow piper that he has finally tried one of mine with a new stem and said he will order a couple in the future. I am looking forward to buying a few more in the future for my sons, so when they come home we can smoke together. I been smoking for over 30 yrs. I own dunhills, petersons, ben wades, and nice meerschuams. 50 or 60 pipes. In all my smoking years I have aways been a missouri meerschuam snob. I just bought the freehand missouri meerschuam(with black finish) and just it. A worth smoke now joins the ranks.